Monument Coming Home, Burnam’s Ferry Centennial Marker Being Relocated After 45 Years. 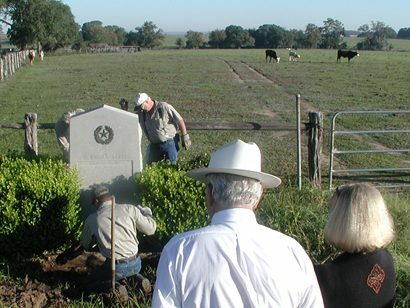 The 1936 Texas Centennial marker commemorating the historic site of Burnam’s Crossing on the Colorado River near Holman is on it’s way home. The distinctive gray granite monument was moved from its original place on the riverbank near Holman in 1963 at the instigation of two local historians (both now deceased). Fayette County Judge Ed Janecka and Historical Commission chair Linda Dennis watch while Precinct Four employees prepared to bring the 1936 marker commemorating Burnam's Crossing on the Colorado River back to Fayette County. They contended that Colorado County was the actual site of the historic river crossing. But the move was without the knowledge or consent of the State Historical Commission which owns the monument. The monument was re-installed in 1964 on Sedan Road across the Colorado County line near Weimar, where it remained for 45 years. That was longer than it had been in its original and correct location. 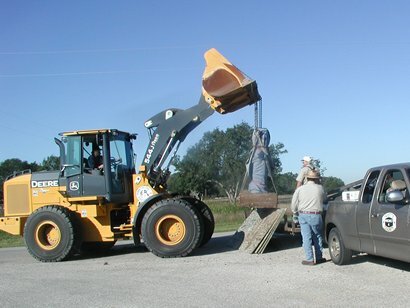 That’s when Precinct 4 Commissioner Tom Muras and his crew successfully unearthed the monument, loaded it on a flatbed trailer and hauled it to the Stasswender Foundry in Austin where the concrete base was removed. The medallion will be installed after the monument undergoes more modifications that reflect its unusual history. Part of that history was on view in Austin Friday. Two sets of initials and the date “1964” were found on the base before its removal. Negotiations are underway for a Marble Falls firm to “plane down” the back of the monument, Dennis said, creating a new ‘front” surface for it. The original commemorative wording (which was obliterated by those who moved the monument) would then be engraved on it. A plaque will be installed on the new “back,” above the altered inscription, explaining the monument’s unique journey. Dennis said several generations of Burnham family members are planning to attend the rededication of the monument in its new location on the corner of Anton Salas Loop and FM 155 (the road between La Grange and Weimar). Editor's Note: Our thanks to editor Larry C. Jackson and staff of the Fayette County Record for sharing their history with the rest of Texas.